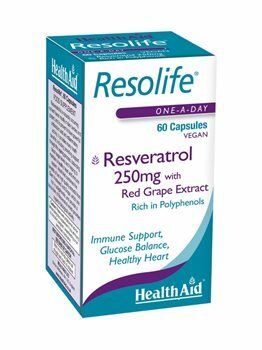 Resolife Capsules contain Resveratrol, which is a naturally occurring nutrient found mostly in dark berries and grapes; and is proven to have powerful antioxidant properties. It provides many health benefits; including providing support through the ageing process, helping to maintain a healthy heart, blood sugar levels and immune system. ResolifeCapsules combine the benefits of two high quality extracts from Giant Knotweed and Grape, which are rich in polyphenols; and provide a trans-form of resveratrol with superior biological activity. What are Resolife Capsules for? When should I take Resolife Capsules? Resolife Capsules can be taken on a daily basis to help enhance immunity as well as for general health and well being. Japanese Giant Knotweed Extract (polygonum cuspidatum), Capsule Shell [hydroxy propyl methyl cellulose (HPMC)], Bulking Agent (di-calcium phosphate), Red Grape Extract (vitis vinifera), Anti-caking Agent (silicon dioxide). Adults, one to two capsules daily, preferably with food. Do not exceed recommended daily intake unless advised by a suitably qualified person.